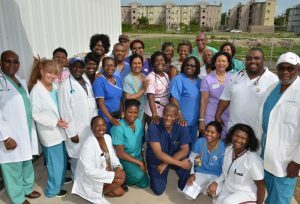 A recent study done by the Inter American Development Bank (IDB) predicts that Jamaica will need just under 50,000 additional doctors and nurses and a similar amount for teachers by year 2040. On a wider scope the study revealed that Latin America and the Caribbean will need approximately 12 million teachers, 3 million doctors and 8 million nurses by the year 2040. For decades it as been well documented that region has been losing its health professionals at an alarming rate particularly for those who are working in the public sector where working conditions are often described as deplorable and medical supplies are in short supply and medical equipment is either broken or inoperable. Compounding this situation is that as fast as health professionals are fully trained they are quickly lured away by recruiters to work in greener pastures abroad and this particularly true for specialist nurses. The solutions are complex as it requires that governments have to increase salaries and improve working conditions and provide other incentives for health professionals to remain in place and unfortunately this competes with other national priorities like energy, trade and tourism, with healthcare and education ending up at the bottom of this list. It is ironic that in order for a nation to be able thrive and prosper it must have an educated and healthy workforce.